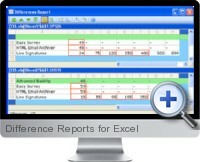 Difference Reports for Excel (Compare Spreadsheets) is a stand alone Windows application that reports the differences between two Excel spreadsheets. � Excel workbooks are compared and changes or differences are highlighted with advanced options for the reporting. Specify entire workbooks, sheets or ranges of cells to be compared. Specify what comparison mode by cell values or formulas. Customize the highlighting the different cells (background color and/or the color and style of the cell border). Results are presented as a comprehensive report for fast auditing. Ability compare any cells in the final report. Supports Excel file formats for Excel versions 2000 to 2010.